Preheat oven to 400°. Grease muffin tins or prepare tin with cupcake wrappers. Remove from oven. 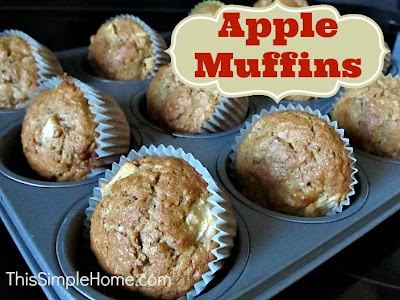 Using a knife, tip the apple muffins on their side in the muffin pan. This will allow them to cool without cooking the bottom extra. Allow the muffins to cool for about five minutes, otherwise these are hot! If still too hot to handle wait a bit more. Then remove the liners and enjoy! *My friend's son has a dairy allergy, so she substitutes water for the milk. I expect I will make them regularly since they are so good! (I just have to sweep the floor afterwards...my kids are messy!) I don't even feel guilty letting Little Sister (nearly 2) have a whole muffin! I'll have to try this version of the apple recipe, I've got a different one that is no where near as healthy (lots of oil, which I've started subbing for coconut oil). I think I have all these ingredients on hand - so my try to make these - they look so delicious. And on this rainy chilly day I bet they would smell wonderful while baking. This sounds great! I love the quick oats in there! We are going apple picking this weekend...this is a great recipe to use. Thank you for sharing. I love apple muffins and this sound wonderfully. Pinning.